The quiet period before the next explosive market move is like the calm before the storm. NR7 helps us to find the calm so that we can prepare and profit from the impending storm. NR7 means narrow bar 7. It is a bar that has a smaller range than the six bars before it. It is a range contraction that precedes range expansion. 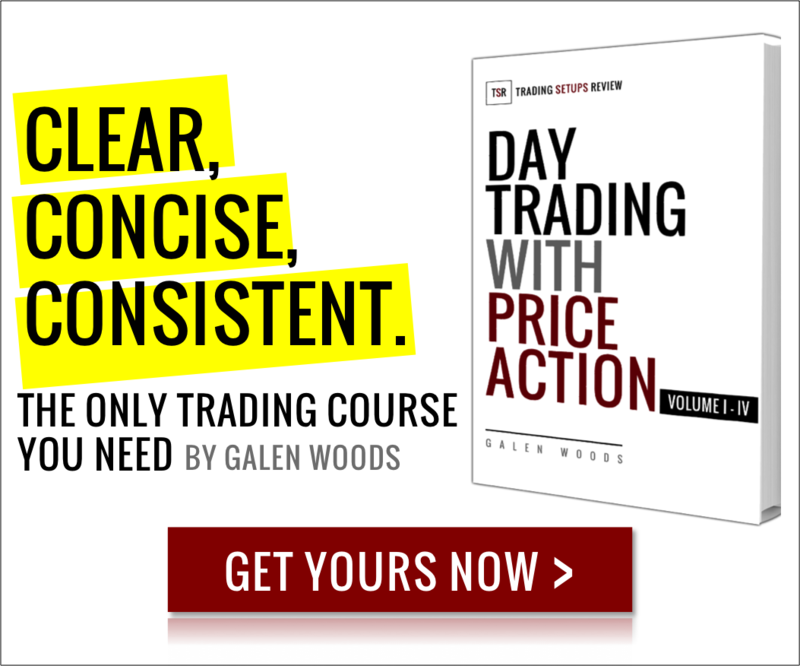 In our trading strategy, we add a simple trend rule to find low risk trend trades. This is a 3-minute chart of CL futures on NYMEX. The orange line is the 20-period EMA. The NR7 bars have a yellow background. Price swung down from above the EMA with eight consecutive bearish bars. 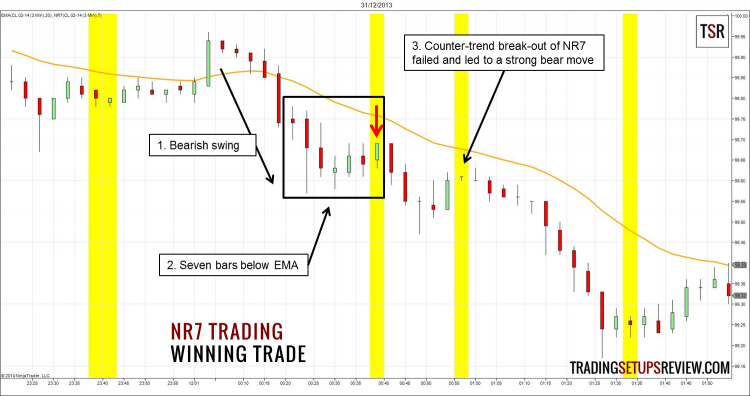 The seven bars that defined the NR7 bar were all below the EMA, showing that the bearish momentum held up. 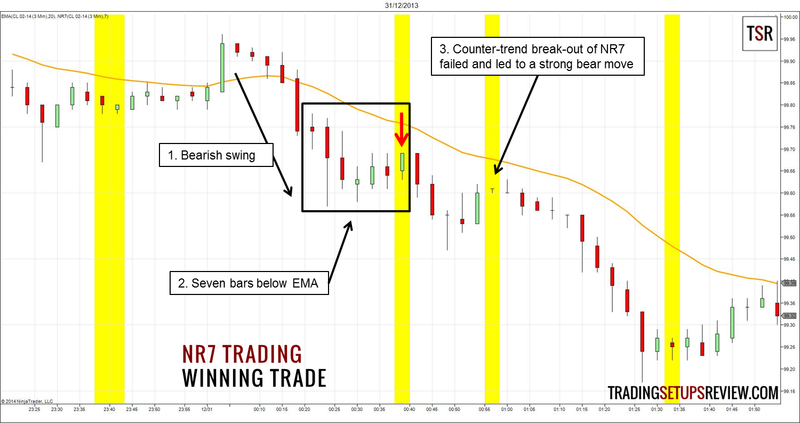 Although the NR7 bar closed higher than its open, it formed a micro triple top with the two bars before it. After the low of the NR7 bar broke, we went short. Price came back up to test the break-even level of the trade. However, following a failed bull break-out of the doji NR7, prices plummeted. The doji NR7 is also a great example to warn us against using NR7 to trade reversals without confirmation from other analysis. This is another 3-minute chart of CL futures. In this example, the NR7 trade experienced whipsaws. The seven bars leading up to the NR7 bar were all below the EMA. Despite the four bullish bars in the retracement, price could not reach the EMA. As price broke the low of the second NR7 bar, we went short. However, the consecutive NR7 bars was a hint of the tight congestion that followed. Price hit our stop-loss at the high of the NR7 bar. It was a false break-out that reversed and continued the bear trend. Re-entry was a valid option as price stayed below the EMA throughout the retracement and our bearish outlook was not compromised. 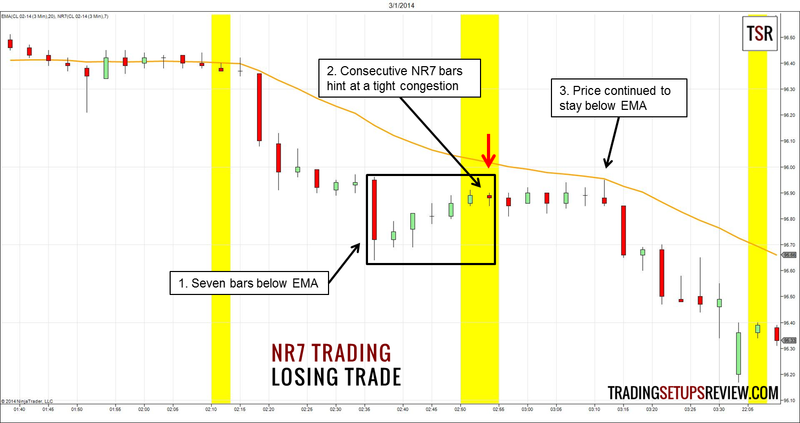 Toby Crabel studied the NR7 pattern together with the NR4/ID trading setup. Both patterns are popular trading tools found in many trading strategies. In this NR7 trading strategy, we looked for markets with a strong trend and used NR7 as a low risk entry point to join the trend. Do not follow the trading rules mechanically. Some NR7 bars appear at the high of a bull trend or the low of a bear trend. These setups are not the target of our trading strategy. Wait for a real pullback to enter. Be very careful when you see multiple NR7 bars. Narrow range bars in proximity are a sign of price congestion in which NR7 patterns are less reliable. Remember to follow the path of least resistance. The best NR7 bars occur when price is moving against the path of least resistance. Excellent! Could I ask you an off topic question ? How should I intrepret a large bullish candle with a shaven head in an established up trend ( possibly engulfing) that sees a spike in accompanying vol but then proceeds to fail or reverse ? Thank you very much ! Hi Frank, you’re describing an exhaustion type price move which can take on various forms. Take a look at this article on Anchor Bars. Could you clarify little more? In a downtrend, has to be 6 bars closing lower than 20 MA and the 7th has to be a inside candle and then you buy on 8th bar ? First, there must be seven bars completely below the MA. This means that the high of each of these seven bars should be below the MA. Next, the 7th bar does not need to be an inside bar. NR7 simply means that the 7th bar has the narrowest range among the most recent 7 bars (including itself). Finally, you do buy on the 8th bar, provided that it breaks out of the range of the 7th bar (NR7 bar) in the direction you are trading.